Lake Ozark, MO, November 22, 2017 –(PR.com)– Lakefront Living International, LLC is proud to welcome Real Estate Broker Annie Faulstich of Lake Ozark, MO as its latest Lakefront Living Realty Franchisee. Annie Faulstich is no stranger to the Lake of the Ozarks. Growing up at the lake not only gave Annie a love for the lake lifestyle, it gives her unique insight into the real estate market in the area. Annie and her husband Jesse, who also is a native of Osage Beach, feel fortunate to be able to raise their family in this unique community. Lake of the Ozarks is a massive 54,000-acre man-made reservoir with over 1100 miles of shoreline. There are over 70,000 homes along the lake, many of which are vacation homes. “With numerous settlements located near or on the Lake of the Ozarks, it presents a tremendous opportunity for Annie to show her clients what a true lakefront specialist can do for them,” added Christine Mosier, COO of Lakefront Living International. 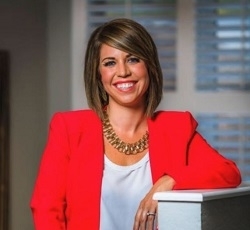 Annie’s background in construction led her to begin building new construction homes, buying properties, rehabilitating or redesigning them, and then selling them. From being a buyer and seller herself, a career in real estate was an easy transition. But what has made her career so successful is Annie's ability to develop friendships with people from every walk of life. "I just generally really like people, and this career gives me so many opportunities to build lasting relationships," Annie says. "Growing up here, with so many fond memories, it's a big part of my heritage. I love being able to connect people to this Lake life that I get to enjoy every day. The relationships this job allows me to build really feel more like family than professional or business relationships." To understand the value a true lakefront specialist can provide to you as a Lake of the Ozarks buyer or seller, contact Annie at [email protected] or at (573) 216-4350. Based in Mansfield, Massachusetts, Lakefront Living International, LLC is an innovative real estate franchise company offering brokers the ability to focus solely on uniting buyers and sellers of lakefront property. Franchised “Lakefront Living Realty” Brokers can immediately channel their lakefront passion into a dynamic business venture by dominating their local lakefront market utilizing a proven, packaged business model. Addition information on the franchise offering can be found on LakefrontLivingFranchise.com, requested through [email protected] or call (844) MyLakes, (844) 695-2537.